My 9-year-old son, Javier, loves to cradle small toys in his hands. It’s a habit he formed when he was a toddler. At first I thought he simply loved the plush key chains or wooden blocks he grabbed, but when I started finding them tucked into his chubby fists long after he fell asleep, I realized those miniature toys were as much a source of comfort to him as a fun toy to play with when boredom struck. The first time our family went on vacation to visit my family in Miami, I remembered his love affair with tiny toys and packed a Ziploc bag full of ‘em. Everywhere we went I’d hand him a tiny toy solider or mini plush animal if he became fussy. In most cases they disappeared into his little fists almost as quickly as any whining or crying, the toy morphing into a fun lovey at the moment when he most needed it. I wouldn’t call it a miracle worker, but it certainly bought me some time until I could figure out what was wrong and fix it. They were especially handy when our connecting flight was delayed and we were stuck sitting on the tarmac. Of all the tips my mom friends gave me over the years about things to pack in my carry-on, tiny toys that fit snugly into my little one’s hands had never come up, but even now that my boy is almost 10, I still find him with miniature Legos tucked into his hands — even when we’re not traveling! 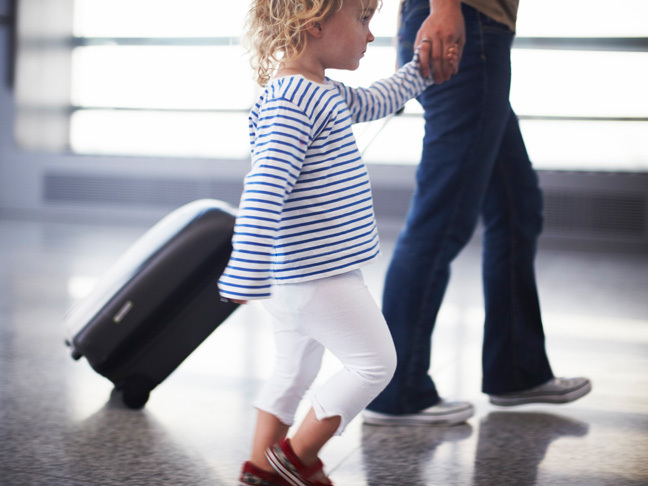 Vacationing with your kids can be a rewarding experience for everyone, though it’s usually not without a couple of flare-ups of the crankies, whether it’s because of a delayed flight, exhaustion, hunger, or something else. Sometimes the balm that soothes your kids most when traveling is the thing you’d least expect. 1. Glow sticks. Amy Allen Johnson, a mom of two in Salt Lake City, Utah, never forgets this item. “They make great night lights when you’re in a hotel and you need to change a diaper in the middle of the night but you can’t find the light switch or you don’t want to flood the room with light.” They’re also great at keeping kids busy when, say, your flight is delayed or they simply get bored. It doesn’t even have to be dark out; kids love to play with glow sticks! 2. Pipe cleaners. For just a couple of dollars you can pick up these multi-colored, bendable sticks at any craft store. “They keep hands and minds busy, and kids love them,” says Lisa Lindner, a mom of two in Oviedo, Florida. They can make little toys with them, and some websites even show you how to make animals and other toys with easy step-by step instructions that you can print out. They’re also lightweight and easy to carry. 4. Ten to 15 Legos. Erin Volz, a mom of three in Orlando, Florida, relies on these to keep her preschooler busy whenever she flies across country to visit family. “We use them to build things, practice counting, and sometimes we even make up games,” Volz says. If your kids are preschool age or younger, choose the slightly larger Duplo Legos that don’t pose a choking risk, like the tiny ones do. 5. A treat or toy you wouldn’t normally give at home. Kids love new stuff. Nothing gets them to relax more than a treat or toy they don’t have at home. If your kids are weak for brownies, there may not be a better time to let them enjoy the sugar fix than when you’re traveling. If you’re worried it will make them kinetic, try a kids’ crossword puzzle or a portable game instead. I bought my son the latter at the Dollar Store once before a trip to Grandma’s, and he played the game the whole time. It was the best vacation dollar I ever spent.